Optimize health and human performance through the integration of nutrition with sports, physical activity, cardiovascular health, and well-being. A world where all people perform to their potential powered by nutrition and physical activity. SCAN members are recognized experts in food and nutrition for sports performance and physical activity, cardiovascular health, wellness, and disordered eating and eating disorders. SCAN members value the integration of four practice areas to provide comprehensive evidence-based medical nutrition therapy to improve the health of those we serve. Members and prospective members view SCAN as key to professional success. 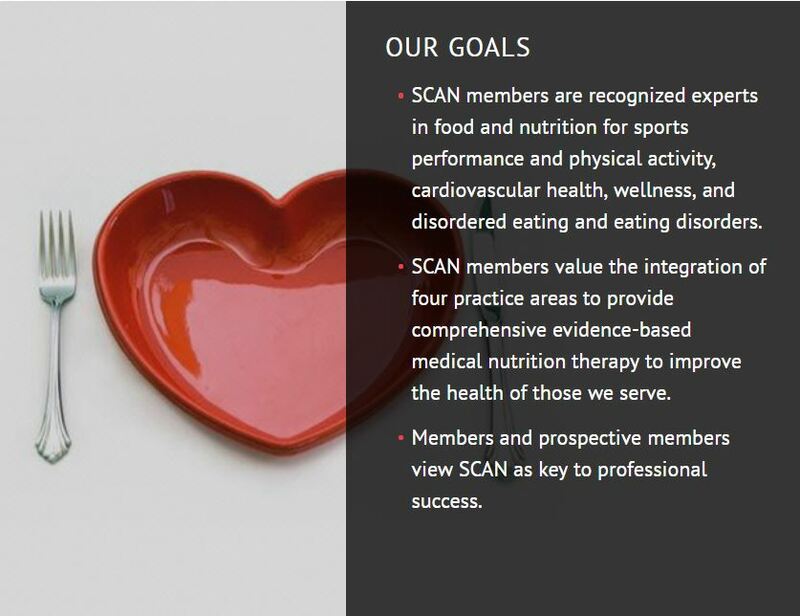 As a dietetic practice group of the Academy of Nutrition and Dietetics, SCAN is dedicated to nutrition for sports performance and physical activity, cardiovascular health, wellness, and eating disorders and disordered eating. We hold to a set of essential beliefs that forms the basis of our mission and vision and are manifested through the principles of excellence, integrity, and credibility that are evident in all our endeavors. These beliefs are embodied in the relationships we build and maintain with our constituents as we fulfill our responsibility to them. We educate consumers about sound nutrition practices and how these can nourish the body and reduce the risks and impact of disease. We do this first by doing no harm and next by providing sound, evidence-based information. Our audiences include athletes, consumers, health and fitness professionals, the media, and members of the food and nutrition industries and regulatory agencies. We recognize the diverse backgrounds of these constituents and tailor our services accordingly. We acknowledge members as our greatest resource and embrace our diversity. We provide members with strong leadership that is centered on a food first approach to achieving peak performance and optimum health and wellness. We recognize our members as preeminent authorities in their areas of practice, and seek on their behalf new opportunities for research, practice innovation, and professional growth. We provide prompt and courteous support, timely information, and a forum for the exchange of ideas in a safe and collegial environment. We offer leadership development, opportunities to serve and network, and professional recognition. We collaborate with entities that share our commitment to using the best science and healthful eating practices to guide the public in making sound nutrition choices. Using our collective resources, we empower people to take charge of their health, reduce the risk of preventable illness, and maximize performance. We maintain the highest standards of ethical behavior as set forth by the Academy of Nutrition and Dietetics.